The Leeds & Liverpool Canal is the longest single canal in Britain (127 miles) and is considered by some of its devotees to be the finest in England for variety, scenery and interest. A canal across the Pennines, joining the valleys of the Aire and Ribble, was first proposed in 1766 by woollen merchants in Bradford who needed a reliable and frequent supply of lime and limestone from Craven, used for land improvements and in building construction. However they also needed a route to ports such as Lancaster and Liverpool where their woollen goods could then be sent to the American colonies. 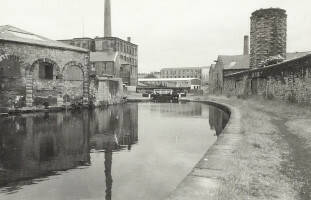 The canal was planned at first to link Leeds and Bradford to Preston. However very soon the rapidly growing port of Liverpool became the preferred destination. The route planned by the Yorkshiremen was up the Aire valley and across the Pennines by way of Gargrave and Barnoldswick. It would then go north of the River Calder, crossing into the Ribble Valley over an aqueduct at Whalley Nab. Limestone was the reason for this route which passed close to quarries in Craven and Clitheroe, with Liverpool being reached by crossing the low meadows and arable land of west Lancashire. To finance this huge project, merchants in Liverpool were approached for support. They, however, had a different idea. As they needed a good coal supply to support industry in Liverpool they suggested a route from Barnoldswick through east Lancashire and Wigan, which would join the Yorkshiremen's route again at Parbold. The two sets of merchants argued over the route until, at a meeting in Burnley in 1768, they finally agreed on the latter route. The canal was authorised by Parliament in 1770 and by 1777 it had opened between Leeds and Gargrave and from Liverpool to Parbold where it joined the old River Douglas Navigation which allowed access to Wigan's coal mines. The canal was eventually completed in 1816, some forty six years after construction had first begun.